New research from a team of scientists and their collaborators from Florida State University is helping to connect the climate changes we’re facing and a dramatic decline in bumble bee population all over the planet. The study was published in the famous Ecology Letters journal. 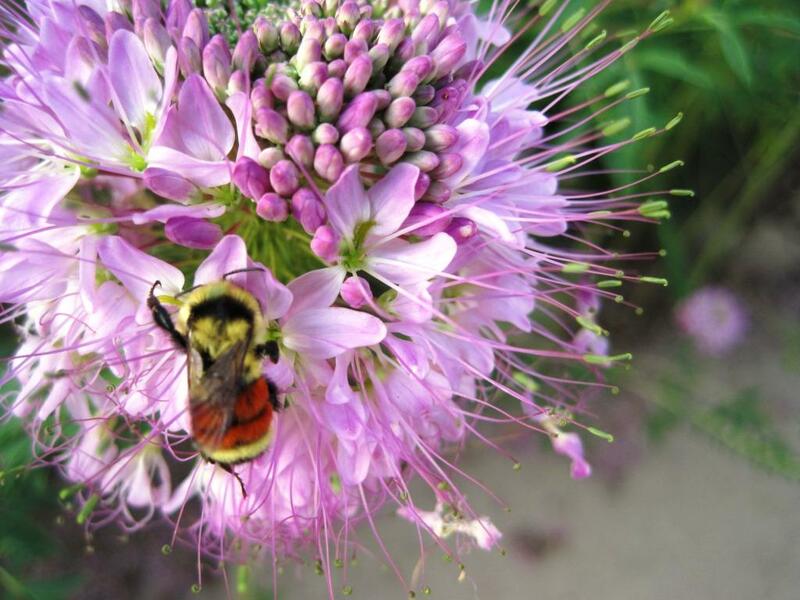 The scientists were researching three types of bumble bees species in Rocky Mountains, Colorado. Some of them are facing huge problems, because for them, the changing climate means the lack of good quality flowers to go around. said Jane Ogilvie, the Florida State University postdoctoral researcher who was the study’s lead investigator. The research team found out that the abundances of all of the bee species were affected by indirect effects of climate. Since the global climate and weather conditions change from year to year, the seasonal cycles are not always the same, meaning they shift due to the climate changes facing. In mountain areas like the ones researched snow starts to melt earlier than before and so is the flowering season extended. At first, the extended flowering season could seem like there are more opportunities for all those bees to feed, but the truth is different. The research has shown that, when the snow melts earlier and the flowering season extends, there is a longer period of poor flower availability which in the end results in lack of food for the bees which can later be associated with the population decline. 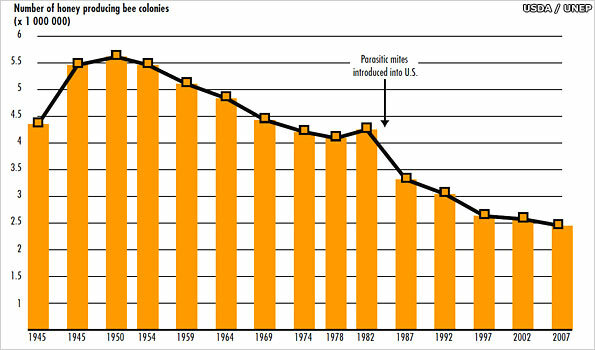 Declining of the number of living bees has been a cause for alarm among many biologist and scientists. Bees are well known for having annual life cycles, a lot shorter than people, so they quickly show response to any change in the environment they live in. Moreover, bees are very important factor for agricultural productivity and propagation of plant seeds. The modern record-keeping and measuring is known for the last 137 years. That is the time perio for which we have the weather and climate data collected. This year’s August was the second warmest August in the last 137 years of modern record-keeping, according to a monthly analysis of global temperatures by scientists at NASA’s Goddard Institute for Space Studies (GISS) from New York. This result was not accidental since we can see that the measured value is consistent with the trend in global average Earth’s surface temperatures. This trend has been observed during the past few decades. In average, this year’s August was approx. +0.85 degrees Celsius warmer than the mean August temperature between 1951. and 1980 which is also an indicator of global warming and climate changes. 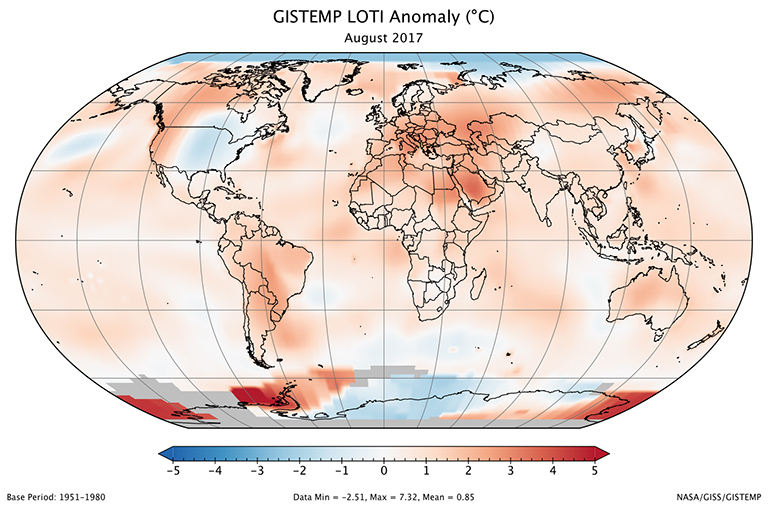 A global map of the August 2017 LOTI (land-ocean temperature index) anomaly, relative to the 1951-1980 August average. Part of Antarctica is gray because data from some stations there were not yet available at the time of this posting. So, which August was the warmest so far? Of course, it was the August of 2016 which was even warmer than the one of 2017. It was because August 2016 was still affected by the El Niño and was 0.99 degrees Celsius warmer than normal. However, August 2017 was approximately 0,2 degrees warmer than the August following the last large El Niño event in 1997-1998. This research has been made by NASA’s team and has been made by acquiring data from more than 6.300 different meteorological stations from all over the world, as well as on the surface of the seas and oceans. Apart from measuring air temperature, sea surface and Earth’s surface temperatures were also measured in order to give us the summary. Even the Antarctic researching stations were included in this data gathering. The measuring we know today has started somewhere around 1880. There is some data from the dates before the mentioned year but are not competent since the measuring didn’t cover enough of the planet. It was not only the August which was above average. In the last few years we record some groundbreaking data from our meteorological stations all over the world. The predictions of the scientists and researchers is that many more months to come will come with the + sign. That meaning that the following years are likely to be even warmer that this one was, which is nothing to be surprised with. This trend will continue to rise for many years to come, if we’re to trust NASA.